Lambeth in South London, Bonfire Night / Fifth of November. Present Day. 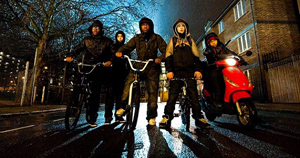 A young nurse called Sam (played by Jodie Whittaker) is mugged by a gang of masked hoodies: Moses, the quiet but serious leader (played by John Boyega), Pest by name and nature(played by Alex Esmail), Dennis (played by Franz Drameh), Jerome (Leeon Jones) and Biggz (Simon Howard). In the middle of this, a meteorite plummets from the sky into a nearby car in the street as the boys steal Sam’s valuables. Moses, ‘allows’ (“Allow It?) Sam to escape, and when he tries to ransack the car, he is attacked by a creature. Once wounded, he chases the creature and kills it, with the help of his friends. They realise the white alien’s corpse might be worth something and go to Ron (a drug dealer, played by Nick Frost) for help. Ron lives at the top of their Tower Block, in Hi-Hatz’ flat. Ron’s boss (the head gangster Hi-Hatz, played by Jumayn Hunter) lets them keep the “weed room?, the safest and most secure place in the entire block of flats. In return, Moses has to upgrade from selling weed to cocaine. Seeing this as going a rung up the ladder, and aware of the financial implications of their find, he agrees. However, this is not the end. More meteorites / creatures come from outer space to the area. On seeing this, the teenagers confidently get weapons (or ‘tool up’) to defend their ‘Block’. We are introduced to other characters (Probs and Mayhem, who are younger boys who aspire to be part of the gang) and Brewis (played by Luke Treadaway, a young zoologist and marijuana smoker, modeled on a young Joe Cornish). The new aliens are a lot bigger, jet black with huge claws and teeth which shine neon-blue in the dark. Nothing gets in their way.